I recently watched Air Crash Investigation, Air France Flight 447. The autopilot handed back control to the flight deck after the pitot tubes temporarily froze. The autopilot knew it was getting naff information and said: "We can't deal with faulty information so we are handing control back to the flight crew". This got me thinking. What other instances, beside instrument error, if any, will the autopilot trip out, and hand control back to the crew? An initial Google search was not helpful I am afraid. A pdf of the Airbus systems (350 pages long) was available, and a news source on everything the autopilot does, but nothing mentioning examples where all of a sudden the autopilot may switch off, even temporarily. The reason I ask this is that if this is the only reason the autopilot may trip out, surely the crew of Flight 447 would have been aware that it was due to information that was not correct, and therefore to just remain as they were until the sensors came back to life again. That is what I can not understand. pilot presses the autopilot disconnect pushbutton. applying force to control-stick that contradicts autopilot. activation of high AoA protection. descending below MDA on a non-ILS approach. will it not inform you of why it has tripped out? Pilots check the ECAM for messages and suggested actions. 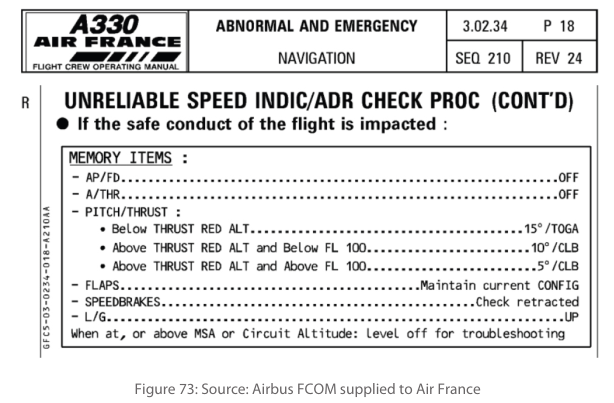 The philosophy for processing the anomaly is described in the “UNRELIABLE AIRSPEED INDICATION / ADR CHECK PROCEDURE” that is in Flight Manual (AFM) and transcribed in the Airbus FCOM and the Air France Operations Manual. Notice that the first two items are for the pilots to make sure the autopilot (AP) and autothrottle (A/THR) are OFF. The pilots did not systematically work through ECAM messages and did not apply the ADR check procedure (one they would have memorised in training). They were confused and acted erratically. They stalled the aircraft, ignored the stall warnings and held the aircraft in the stall from above it's operational ceiling right down to sea level. The sad truth is that the only action really necessary was to keep the wings roughly level for a few minutes. It is possible that if both pilots had folded their arms, tucked their legs back and taken a 5-minute nap, everyone on that plane would still be alive. But in all these circumstances, alarm rings and alerts are shown. These are known conditions from various air crash Investigations. Not the answer you're looking for? Browse other questions tagged safety flight-instruments autopilot airbus-a330 af447-accident or ask your own question. Could the GPS be used to aid the autopilot with speed?